Arrested Development, the hugely popular alternative to Gangsta rap, hit it big in the early ‘90’s. 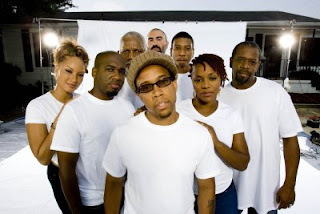 Founded by the rapper Speech, the band put out a string of hits that, not only had a positive message, but also had a positive impact on music. Today, the group has since returned to the very music scene that made them famous. Speech recently talked to me about Arrested Development, past and present. Q - Arrested Development had a bunch of hits in the early ‘90’s with "Tennessee," "People Everyday," and "Mr. Wendal," just to name a few. Then the band broke up. Why? A - The fame coming on us for our initial was overwhelming. You have to understand, to be successful is one thing, but to be named Rolling Stone's, Grammy's, MTV's Best New Artist is another thing. We were only in our teens and early twenties. Q - Why and how did the band decide to get back together? A - We took a five year hiatus. After that we realized that our stop was premature. We felt that calling and passion again. It was an easy decision. Also, I had a successful solo career going on, so for me it was a continuation of something beautiful. Q - One of the things I loved about Arrested Development was the positive message it portrayed in its music. What was the reasoning behind this decision to go positive? A - My momma owns a community newspaper. I always was around people talking about issues. It was just gut decision. Q - Arrested Development’s music also had a spiritual message to it. How did that come about? A - I have an inclination towards spiritual beliefs, now I'm an ordained minister. I don't even tell everyone, only people that know me personally usually know that. Q - The music itself falls into Hip Hop and Rap categories but there seems to be a mixture of folk and blues to it. How would you describe the band’s music? A - We call it life music. It’s passionate, colorful and nourishing. Q - How has Arrested Development’s music changed since the band came out in the late ‘80’s? A - In its foundation, it hasn't changed. How do you change music that always was all over the place anyway? :-) However, it has grown and become more relevant to today. Q - Who would you say the band’s musical influences are? A - Sly Stone, Prince, Soul, Folk, African. Q - What do you think of the music scene today? A - It's in transition. Mainstream Hip-Hop's sold out in their philosophy. They are JUST like Macy's, Calvin Klein, or Reebok, just corporate capitalist. However, the rest of the genre is still in tact, and quite exciting. The rest of the genres are better off than Hip-Hop. Q - What does Arrested Development want to accomplish this time around? Q - What message do you want listeners to take away from the band’s music? A - Live - grow – enjoy. Fans anxious to hear the new music can visit Arrested Development on the web at: www.arresteddevelopmentmusic.com. Very good info, i love you blog, but i am surprised to see your blog never appeared on any search term realted to you niche in google, why so. If you need any free help to make your blog google friendly. ( free of cost ) then please feel free to contact me.